Contemporary educational ideas all my staff should know about. This reflects a lot of my current concerns, particularly around the seemingly unquestioning welcome for the end of levels and the current arguments about either or that are ongoing rather than looking at a sense of what works for young people. Big Fish, Little Fish, Cardboard Box: The Risk of KS2/KS3 Transition. This is a short piece brought about by my daughter in leaving year 6 of her primary school. The school and students put on a lovely leaving assembly that was a great celebration. This got me thinking about my own journey from Primary to Secondary school in the 60s in North London. On the odd occasion I talk about this time people generally view my descriptions of Barnsbury Boys Secondary modern with a degree of disbelief. My Primary School was by modern standards appalling and by the standards of the time I suspect average. I failed the 11 plus it was the last year it happened in what was to become the ILEA. I couldn’t go to the Grammar School but three schools were going to be amalgamated into a new comprehensive called Highbury Grove. one of these schools was Barnsbury Boys. so I went to Barnsbury Boys lower school a Victorian building in a side street called Eden Grove off Holloway Road, it was an appalling place where learning and education were in short supply, a struggle for both students and teachers. What wasn’t in short supply was violence. The school was run by a group of what we would now call year 9 students with the tacit approval of the Deputy Head in charge of the site. This gang ran the school with a sense of discipline enforced through appalling acts of violence and the payment of protection fees. The students enforced their rule through casual and organised violence. Their favourite organised violence was called run rabbit run, this required the person to be punished to run down the length of the old outside toilets while being kicked by gang members in each stall. The punishment for falling over was to have your head pushed into the toilet and for it to be flushed. You could also be required to pay double dues. I would like to think that The Deputy Head Harry was not fully aware of the violence and punishment being dished out to particularly younger students by his protégés who he called prefects but honestly I believe he knew fully what was going on. After one beating I went home and my appalled parents brought me to school the following day to ask this Deputy Head to explain why I had been assaulted by a couple of these prefects on my way home (casual violence). Harry waffled on about how it was all a misunderstanding and how younger boys had to be aware that older students with a position needed to be respected and he would talk to the boys that had assaulted me to find out what had happened (seemed obvious to me I had been beaten up) the crowning point of the meeting was Harry offering to set up the boxing ring so that we could have a fair fight. ( I was 11 and both the boys that had attacked me were 14 so I wasn’t sure how this could be fair). Fortunately my father also thought this was a dreadful suggestion and said that he might be forced to take action if something like that were to happen. In the end the bullying stopped because one of my neighbours sons found out about it and intervened on my behalf and warned the boys off. In some ways the violence of the students was more considered than the violence by the staff who seemed to slipper students on a whim. We had one science teacher who would randomly beat students on the backside with a plimsol, this was so random we would take it in turn to wind him up at the beginning of the lesson and get the beating over with rather than sitting dreading it happening. On another occasion after a metal work lesson in the hut in the playground I was surprised to see the teacher lock one of the year 9 students in over lunchtime. The reason for this became clear part way through lunch when a gang of other year 9 students came and kicked in the door. They then dragged the boy in hiding out into the playground and gave him a really violent beating I kept thinking “where were the teachers” the staffroom looked down on to the playground. Writing this I still have a sense of disbelief the whole story could be revisited to a Prison where the corrupt lazy governor lets the inmates run the jail or an army camp where the commanding officer lets the NCO’s run the camp by bullying violence and intimidation but this was my year 7 in secondary school. There were some good teachers who tried hard to teach and instil some sense of value in learning but these good people we’re let down by dreadfully inadequate leadership. The following year I went to the newly opened Highbury Grove School where Rhodes Boyson was the Headteacher. My beautiful clever daughter will not experience the lack of care and expectation that I and many others experienced at the age of 11. The new comprehensive schools rescued many young people from the poverty of experience that was the standard in a lot of Secondary Modern Schools. The early days of many comprehensive were a struggle like many new schools today the new ‘ were an amalgamation of other schools who brought with them a mixture of staff who in turn had a mixture of beliefs, abilities many of them hugely unsatisfactory. So it took time for these new schools to develop their own identity and again it needed strong leaders to make these new schools work. For those that still doubt my story telling I came across a website dedicated to the school with many stories from former pupils that all echo my own experience. As a teacher for more than 30 years I hope that I have contributed in some way to making sure that the experiences I had as an 11-year-old are not experienced by children today. Please read another part of my blog Caring Teaching for an idea of how we manage the transition to BIG school. 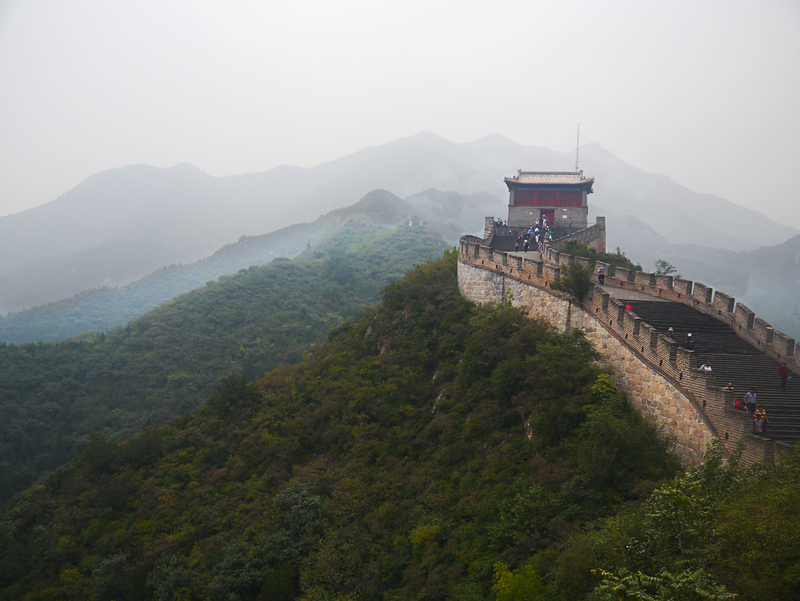 Chinese Bridge for UK Schools is a project organised through the SSAT and the Confucius Institute headquarters, known as Hanban is the official Chinese organisation for the promotion of Chinese Language and Culture around the world. 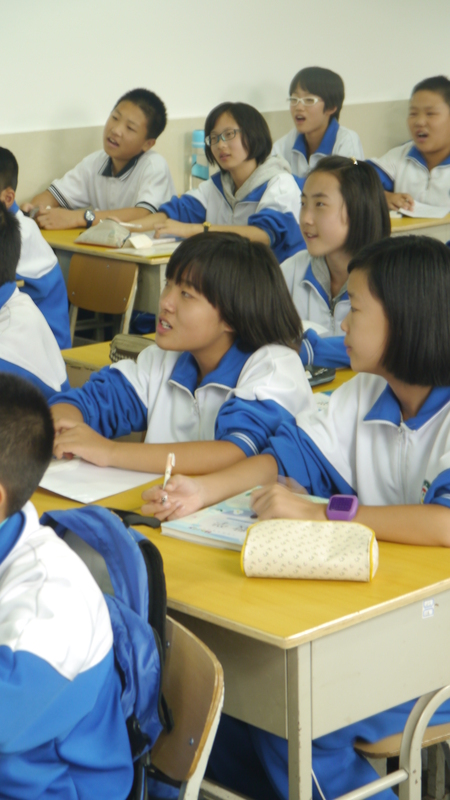 The Confucius Institute helps provide teaching resources and Chinese volunteer teachers to encourage schools to teach the Chinese language. Many of these already exist in different parts of the UK across all phases of education. 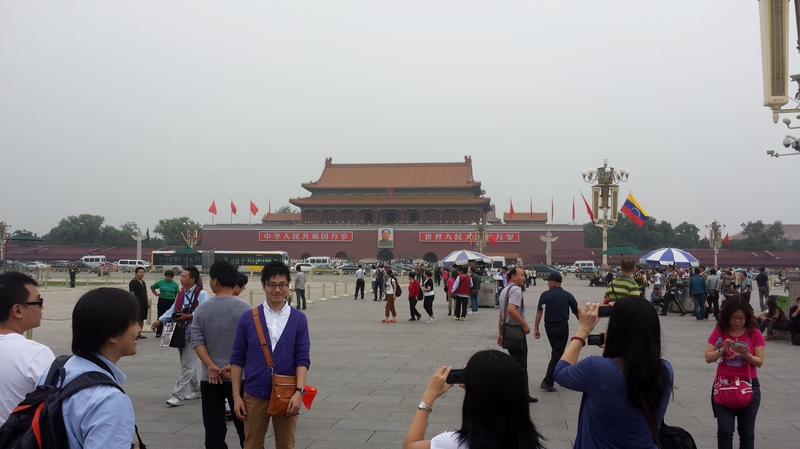 About 70 teachers covering all education sectors from HE to Early Years went on the trip to Beijing before the group split into two with one going to Jinan in Shandong Province and the other going to Hangzhou in Zhejiang Province. 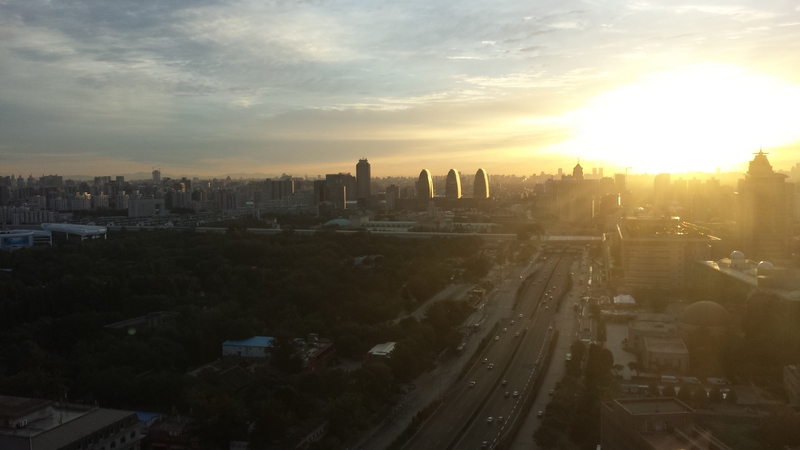 Spending time in Beijing was quite an experience we stayed in a hotel near Beijing Zoo and its metro station. 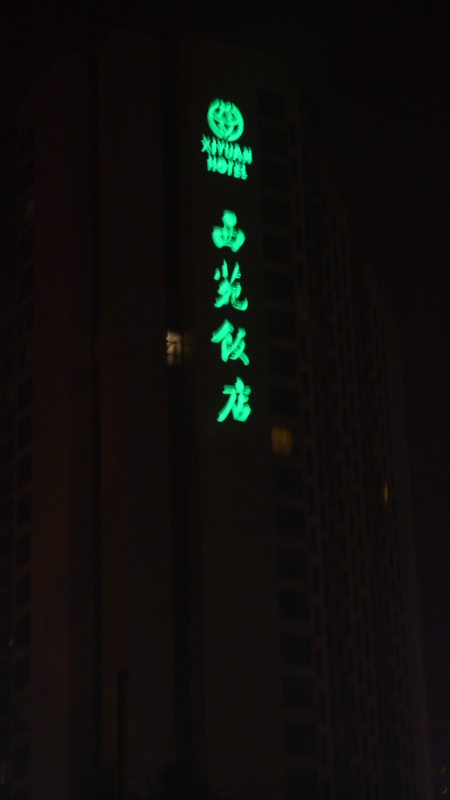 As I have said in another blog I feel very privileged to have been able to visit China in this really exciting point in its very long and dramatic history. 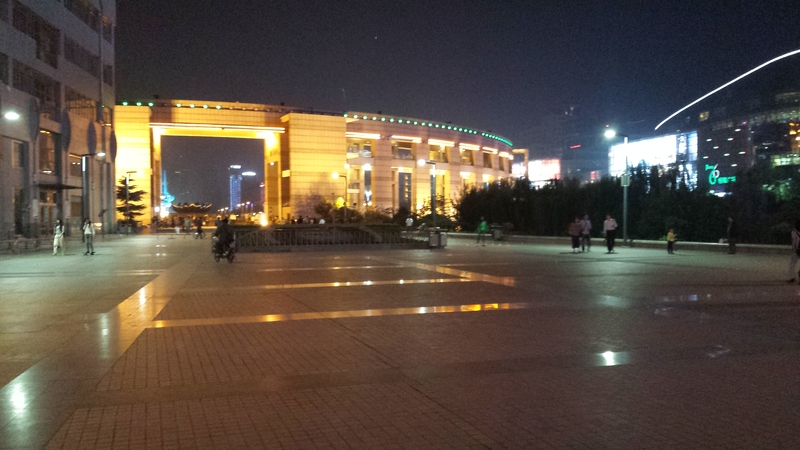 Beijing is an incredible city one of the worlds biggest cities genuinely a megalopolis. We were incredibly well looked after and the majority of us felt that our clothes were a bit tighter after 10 days of being very well fed. 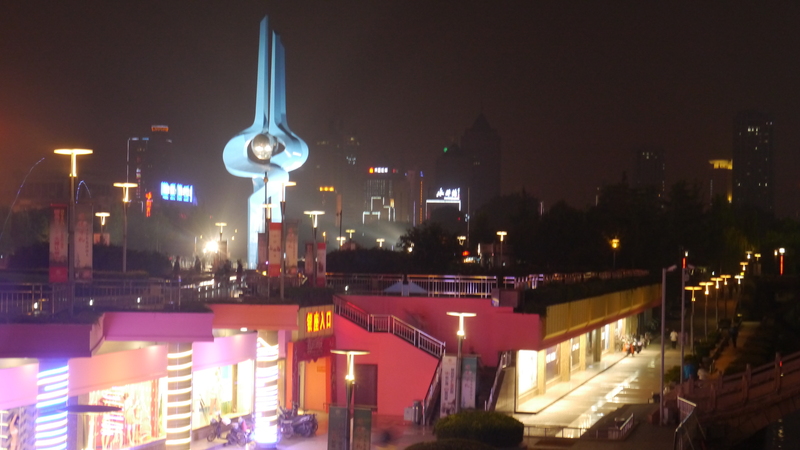 The city has like many areas of China undergone rapid modernisation and while it doesn’t have the mega sky scrapers of some of the cities, it does have the modern steel and glass hotels and a shopping centre to rival Westfield. 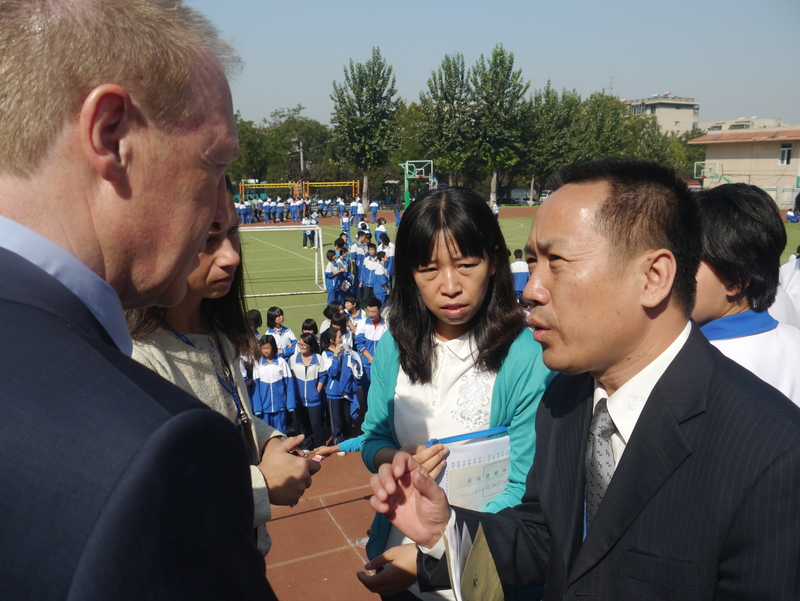 The school we visited in Jinan was the Jinan Shungeng Middle School, the school has 1800 students aged between 13 and 15. Itis a local school and non-selective, it has a reputation as a good school and many of its students score well enough in their exams to get into the very selective High Schools. An indication of the popularity of the school is very similar to London in that apartment prices in the area close to the school are more expensive than similar apartments outside the catchment. The school day starts formally at 7.50am and many students will be in school from 7.30 when it opens, many students will go and see teachers to hand in homework at this time. Lessons start at 8.00am and go on until 12.00am, each lesson is 50 minutes long,with a ten minute break between lessons when students are encouraged to get fresh air, the beginning and end of lessons were announced by playing music over the tannoy system. 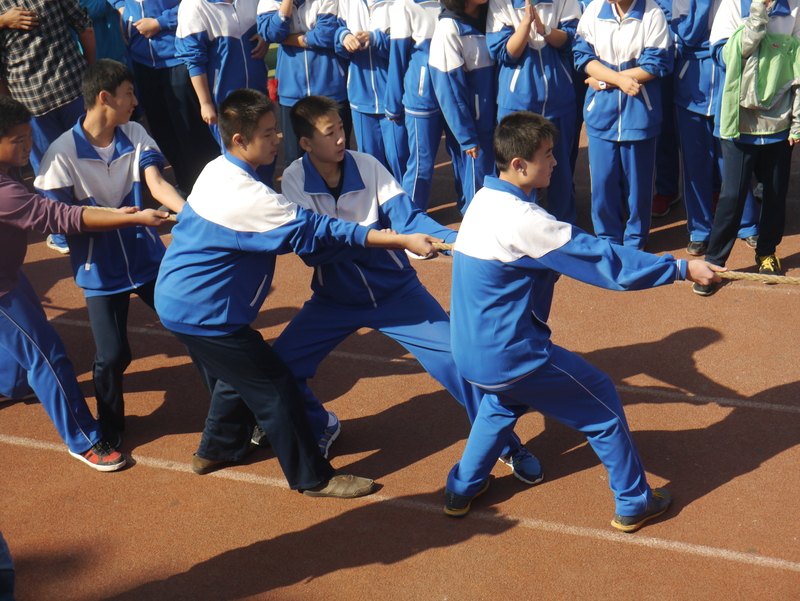 There is a morning break of 25 minutes when students are encouraged to exercise and play games in the playground. 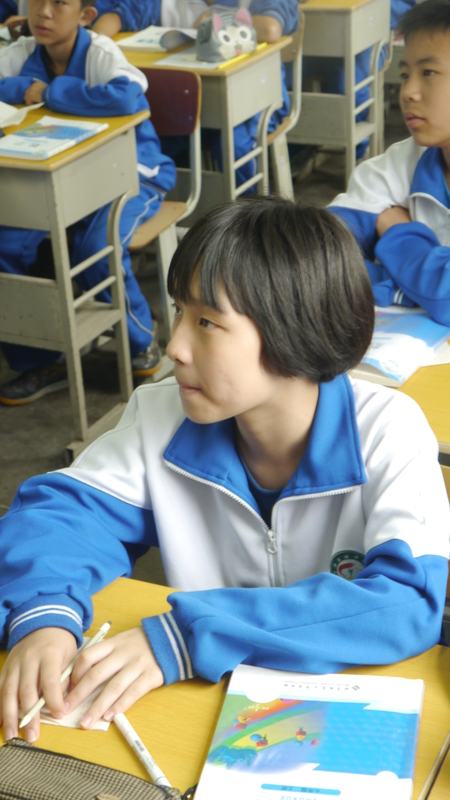 Lunch is two hours and at Jinan Shungeng Middle School all children go home to lunch. Although they can stay on site if they want, to do Homework or make use of the Sports Ground. Classes start again at 2pm and go on until 4pm but students stay in school until 6pm because they will do extra curricular activities and have team practices and clubs. Students are all expected to complete 3 hours homework a night and many students will not get to bed before 1am depending on how much homework they have to do. 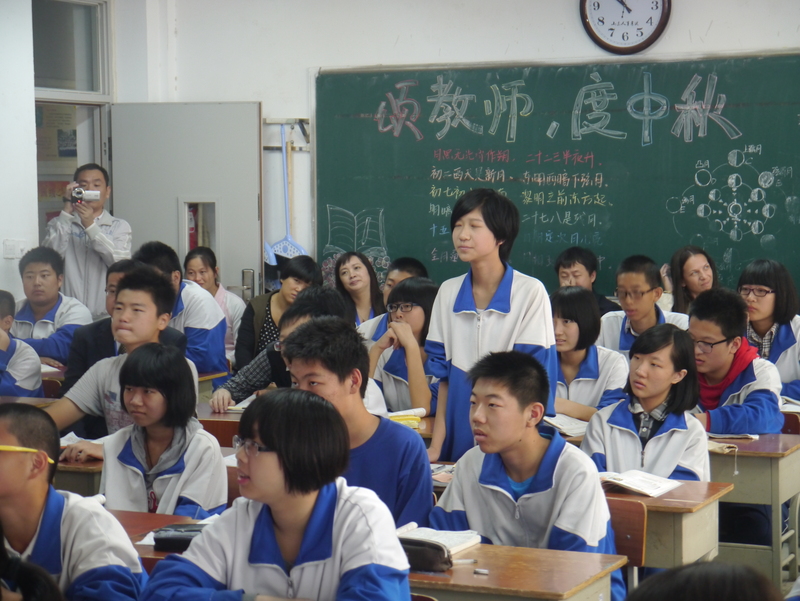 The driving force for this massive work load is in getting the grades required to get into the best high schools that will in turn get them into the best universities either locally in Jinan or moving away to Beijing or Shanghai. Exams have been central to Chinese education for more than 2000 years as they were an essential part of progression into the imperial civil service. Students have a very long day at school and they work very hard but it was lovely to see that they also played very hard, we saw many students having fun, laughing and enjoying themselves in school but as soon as the teacher walked into the lesson attention on the lesson was 100%. 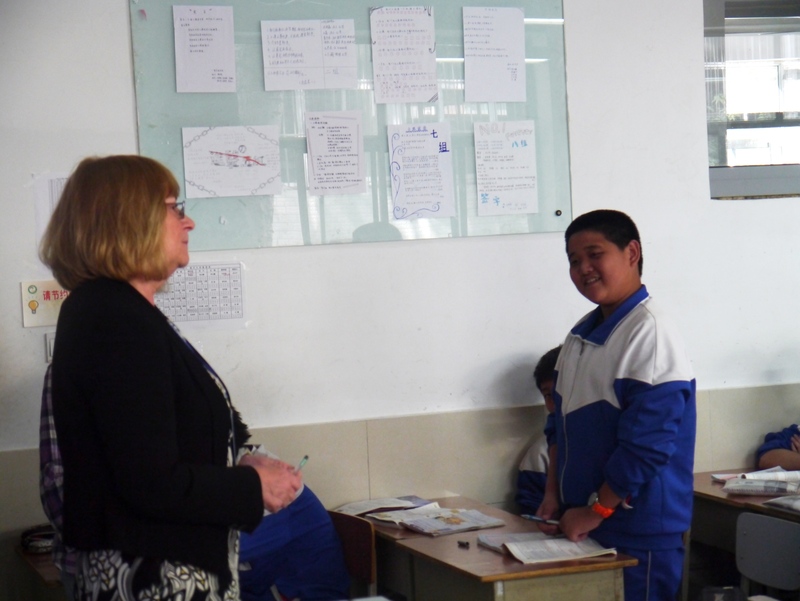 Having said that the relationships between teachers and students in the lessons also seemed to be really good, students and teachers were not afraid of having a laugh together. Physical well being is very important and students are encouraged to be out of buildings during any break and we saw lots of young people working at their sport practice with the same intensity as we say them working on academic practice in lessons. 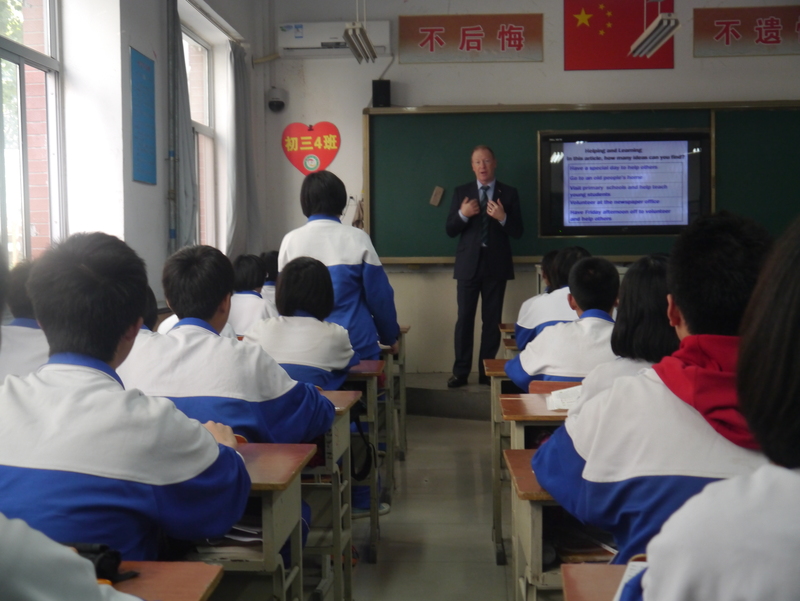 There was also a 20 minute slot in the morning for students to do their eye exercises which is common in a lot of Chinese Schools. After school we were taken to dinner by a member of the Senior Management team and the two English Language Teachers that were attached to the us during the visit Ms Ho and Mr Wong. These two colleagues in particular helped make our visit to Jinan very special and were also happy to answer our questions and help us out. The food was absolutely fantastic, and it took us a while to realise that the food would continue to arrive at the table if we continued to eat everything on the plates and if we stopped eating the food would stop arriving. Cross cultural issues abound with us being brought up to believe its polite eat everything on your plate and everything your host has cooked for you translating to your guests as not having provided enough for their guests to eat. We also learnt that the seating protocols for a classic Chinese Banquet were quite complex all about balancing the power around the table!. All of the teachers on the journey really valued the time that spent in school and are hugely appreciative of The Confucius Institute and in my case the SSAT for the opportunity to take part in this fantastic journey.